PHP eFax is a PHP class that wraps the eFax® Developer API. 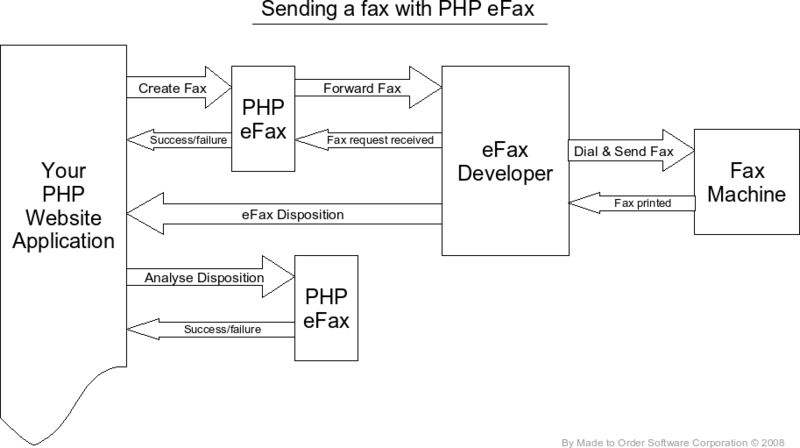 Use PHP eFax to automate the task of sending and receiving faxes electronically from your PHP-powered web server. All you need is an account with eFax® Developer and you are set to go. Processing is usually instantaneous. PHP eFax also allows you to analyze the response you get from the eFax system. Since the eFax® Developer interface tells you whether faxes were successfully sent or not, PHP eFax helps you automate this task. It includes all of the over 200 error messages that eFax® Developer generates and with just four or five lines of PHP code, you will get all the information you need about the fax disposition. PHP eFax can be used to parse the XML message sent by eFax® Developer whenever you receive a fax. This feature helps you greatly since the XML file can easily include 40 tags or more. PHP eFax transforms the XML data in a set of private variables that you can query with one of the 13 simple get() functions. e-Fax is again enhancing their encryption connection and now uses TLS 1.2. Since our latest implementation lets the encryption use the best available encryption available, it will work as expected. Future enhancements should also automatically work with the latest version of PHP eFax. A while back, e-Fax removed all support to the SSL v3 encryption. This is due to the security issue in the protocol used with SSL that Google reported some time in 2014. Unfortunately, up until version 1.7 of PHP eFax, we forced the use of SSL v3 in our implementation. To fix the problem, please upgrade to version 1.8+. Note that if you are still using HttpRequest, we do not know whether that will work or not as we are not supporting that version of the library. Platforms: Microsoft Windows, Linux, Mac OS/X, SunOS, HP UX, etc. Send faxes in minutes from your PHP environment. Receive faxes in PDF or TIFF format. Unit tests to verify the send and receive ends of PHP eFax. Use TLS v1.2 to encrypt faxes. Package includes complete source code. Documentation about eFax® Developer protocol. Known bug on RedHat EL7, replace "tls://" with "ssl://"
1. Your own valid eFax® Developer/business account is required. 2. This system requires a secure connection--you must have a web server that supports HTTPS and a valid SSL certificate. 3. We tested and are using PHP eFax with PHP version 4, 5, and 7. 4. HttpRequest is not required to receive faxes. You can use the parse_inbound_message() function without it.